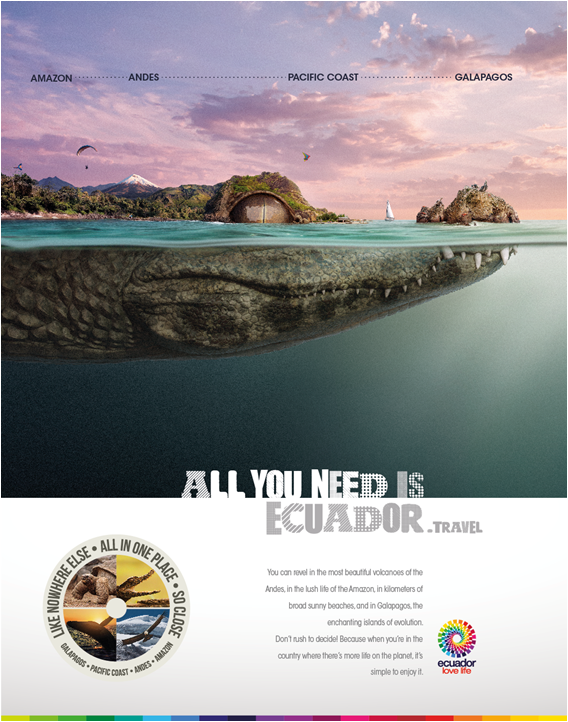 The ad from “All You Need Is Ecuador” campaign won at the CGI Awards in Photokina, considered the most important in the photography and Image industry worldwide. These awards are held every two years, on this occasion they were hosted in Cologne, Germany. Michael Weinzettl, editor of Lurzer’s, a well known German magazine, and judge of the contest, said that the winning image is incomparable and one of the best that have been selected in the awards trajectory. The ad communicates the concept of Ecuador as an enviable country, with four worlds in the middle of the world, bio diverse, magical, compact and unique. As the campaign’s seal expresses: All You Need is Ecuador: “Like nowhere else, all in one place, so close”. The ad will be printed in a book of CGI Awards 2014, together with 200 artistic photos from around the world. It will be published on November 2014. The international campaign “All You Need Is Ecuador” became a milestone with no unprecedented achievements in Ecuador’s tourism historical record. Over 455 million people worldwide have been impacted by this powerful campaign that positioned Ecuador on an international level.